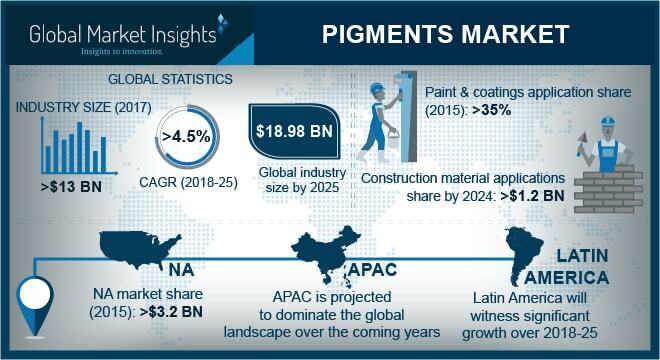 Pigments Market size is forecast to exceed USD 18 billion by 2025; according to a new research report by Global Market Insights, Inc.
Pigments market shall witness promising gains during the forecast period owing to its rising demand in construction industry. Concrete is an indispensable part of construction industry, which is produced from cement. Iron oxide is primarily used for coloring concrete. In 2017, U.S. cement production was 86.3 million tons up from 85.0 million tons in 2016. Furthermore, it is likely to witness prominent growth rate during the forecast period, owing to the increased spending from U.S. government on public infrastructure, which will positively influence pigments market in the coming years. The colorant market is majorly regulated by environmental and construction organizations. There are various safety concerns regarding pigments handling and storage. For example, iron oxide black contains bivalent iron and may undergo oxidation, leading to an exothermic reaction. It is kinetically restricted and is only initiated at elevated temperatures. For this reason, the storage temperature of the product should not exceed 80°C. Also, chemicals such as quinacridone are highly insoluble in water and organic solvents, which makes its biodegradation process very slow. Furthermore, increasing regulations favoring low volatile organic compounds (VOC) as ingredient in paints & coatings has impacted global pigments market size. Pigments such as iron oxide have gained importance in the construction industry in past few years due to its pure hue and tinting strength. Hence, iron oxide consumption is higher in the building materials industry. They are chiefly used in paving blocks, chequered tiles, stamped concrete and designer tiles. One of the most important applications of pigment in construction industry is concrete colorization due to its high dispersibility and superior tinting properties. Just by varying proportion and quantity, color differentiation can be brought about in concrete materials. Specialty pigments will witness substantial growth during the forecast period, owing to its unique properties which are irreplaceable by organic or inorganic alternatives. These provide metallic tones and other special effects such as color-shifting that are increasingly popular in a broad range of consumer products. Paints & coatings industry generated the maximum revenue for pigments market in 2017. This application segment is slated to witness maximum gains in overall colorant market during the forecast period. Printing inks is also an important application of pigments market. These pigments are used in printing inks to create product packaging that attracts consumer attention and differentiates manufacturers’ products competing for shelf-space in retail establishments. Asia Pacific led the global pigments market in 2017 in terms of volume and revenue. Steadily growing construction industry in Asia Pacific will be chiefly driving the product demand over the next few years. The rise in per-capita income of consumers particularly in BRICS has resulted in increased spending in real-estate industry, which has fueled construction industry growth in these countries. This will augment colorant demand in construction over the forecast timespan. BASF SE, Tronox Inc., Huntsman Corporation, Lanxess AG, Clariant Corporation and DIC Corporation are major market players in pigments industry. Mergers & acquisitions is a very common strategy in colorant market. For instance, in November 2015, Merck Group acquired Sigma-Aldrich for USD 17 billion.